Home / Latest News / Butterfly Trust are Chosen Charity for the Wild. Home » Butterfly Trust are Chosen Charity for the Wild. Butterfly Trust are Chosen Charity for the Wild. Our new black game jerseys will carry their logo as will our Website, Facebook & Twitter pages. These will all carry links to the Butterfly Trust’s own pages where you can find more information on what this wonderful charity does and how you can help support them. Our aim of having a chosen charity each season is to raise not only awareness of what the charity does but also to raise funds throughout our season at various events. “The Butterfly Trust was founded in 2002 to provide support to the Cystic Fibrosis community of Scotland. Our aim is that people living with Cystic Fibrosis will have access to the support they need to ensure they can benefit from optimum home care and enjoy the best possible quality of life in the community. This means providing practical help and advocacy to promote their rights by giving them a voice in areas that include housing, finance, education, employment and independent living. We also offer emotional support and counselling to help relieve stress and grants to alleviate financial hardship. 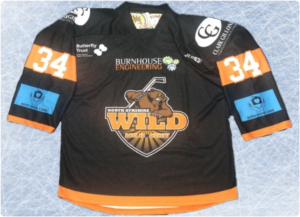 We are delighted to have been nominated as North Ayrshire Wild’s charity partner for the 2018/19 season. When the opportunity came up to apply, there was no hesitation in looking to secure a partnership with a club in the fastest growing sport in Scotland. With Ice Hockey being a fast paced sport, some of our clients have taken up Hockey as a form of physio to help clear their lungs so we were always on the lookout to work alongside a club and we are very grateful North Ayrshire Wild have given us that opportunity. You can support Butterfly Trust when shopping online with Amazon, Search for Amazon Smile, then select Butterfly Trust. Amazon donates 0.5% to the charity and it costs you nothing extra. Win win all round.